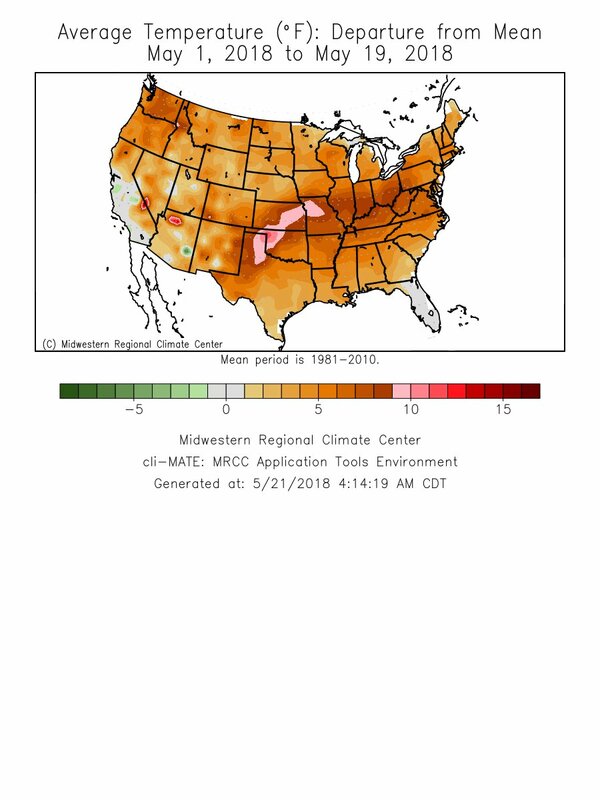 Unusual and what I suspect climate change phenomena have been occurring across the United States the last couple of months. 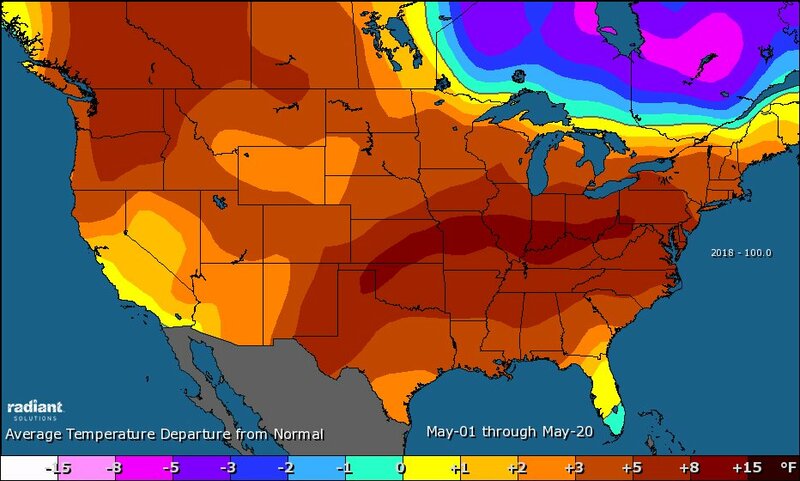 Extreme conditions running the gambit from record cold to record heat have been occurring across the Midwest from April into May. 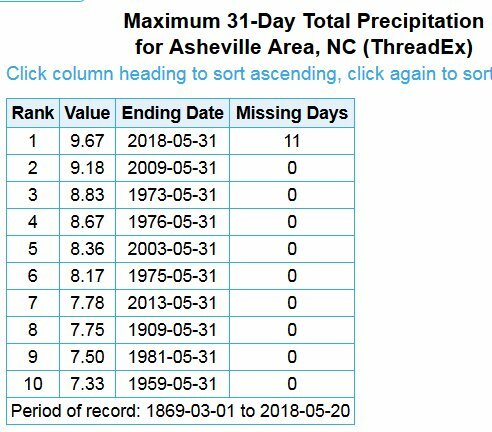 Record rainfall has been falling in the eastern U.S. One could chalk up some of the phenomena to extreme weather, but what we have seen the last two month is on the edge of typical climatology. Here are some items that I have seen pertaining to what I will term “climate change whiplash.” I do emphasize this point: A region will undergo true climate change when its weather more often than not is out of bounds with what is typically expected for a season. Through May 20, the month has yielded 94.1 national population-weighted CDDs, the most on record since 1950 (87.5 in 1962 the previous high). The 58.7 national gas-weighted HDD total is the least on record since 1950 (70.0 in 2001 the previous low). We can see the effect of going from a very cold weather regime for April to a hot regime for May looking at record temperature counts on my “record scoreboard.”For this data set all monthly ratios of > 10 to 1 DHMX to DLMN or > 10 to 1 DLMN to DHMX are in bold type. 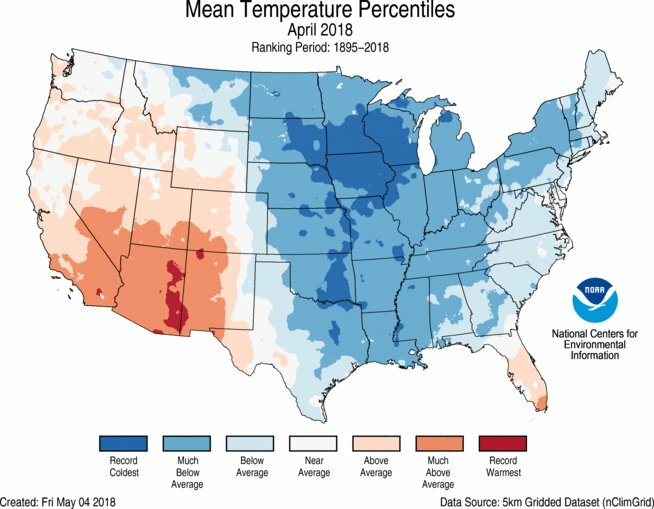 The rankings are for the lower 48 states with the warmest ranking since 1895 of average temperatures being 124 and 1 being the coldest as of 2018. Blue colors represent cold months and red warm. Those months with counts close to a 1 to 1 ratio of highs to lows are colored black. With a ranking of 13 April 2018 was relatively the coldest month since November 2014. Note that as of this post, May 21st, we see another catalogued bold month, May 2018, with a ratio of DHMX to DLMN records above 10 to 1….whiplash indeed. 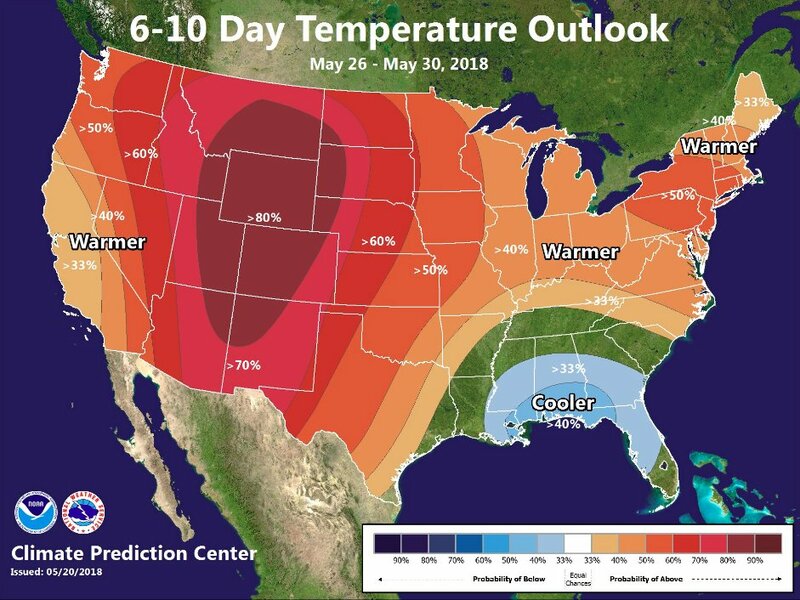 I could make the argument that unless global temperatures decrease drastically any cold pockets or cold weather that does develop will be replaced by an above average temperature regime in a fairly short timespan, and this indeed has happened over portions of the U.S. this spring. 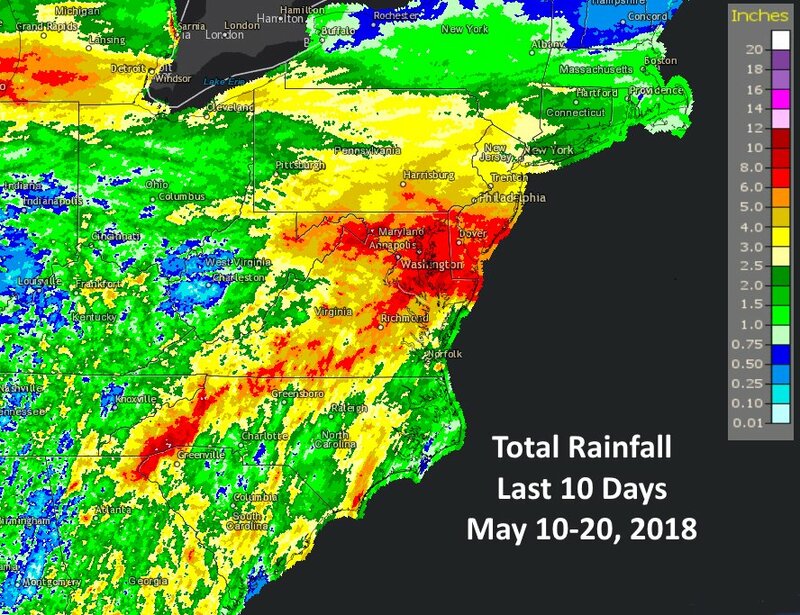 It has been a very wet last 10 days across most of the Eastern US, especially the mid Atlantic and southern Appalachian regions. Total rainfall rankings for the week of May 12-18, from South Florida, Carolinas to the Mid-Atlantic. This graphic from the Southeast Regional Climate Center, shows it was the wettest on record for numerous sites from Key West to Maryland, with many other sites in their top 10! The rest of this month we will see yet more warmth except across portions of the Gulf which might be affected by a tropical entity. I’ll post information about that tomorrow. The last few years, and for a relatively short, recent time, more and more climate scientists are coming on board with the notion that extreme weather can at least partially be attributed to climate change. The last two months in the United States have plenty of fodder for folks to point to and hash out. 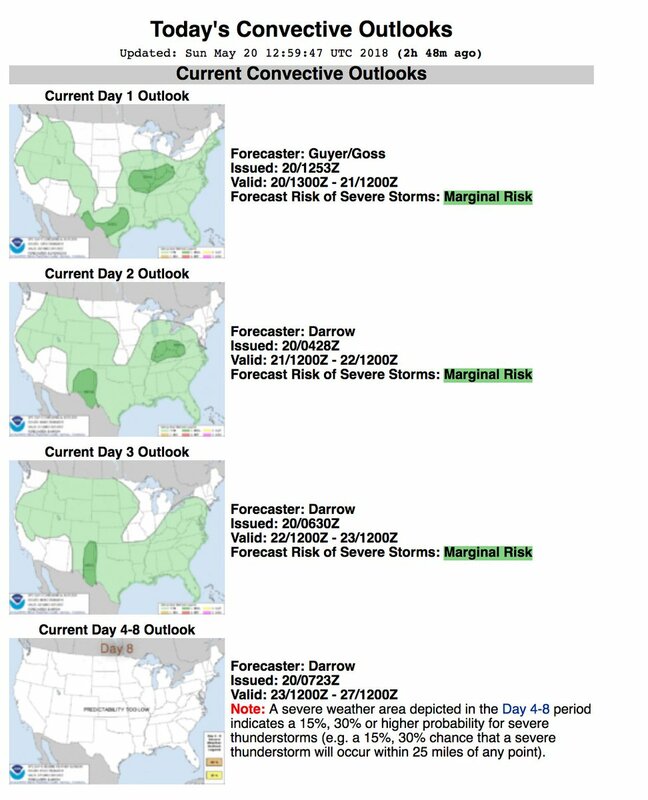 During the summer typically the number of tornadic storms goes down. We appear to be having summer in May. I may add more relevant material to this post later today.